North Sydney Council has partnered with NSW Police and the NSW Department of Justice to implement the Be Safe Not Sorry crime prevention initiative to help make North Sydney a safer place. The campaign is a response to a significant increase in stealing from dwellings and identity theft including stealing from mailboxes in the local area. The North Sydney local government area has the fifth highest rate of steal from dwelling incidents in the Sydney Metropolitan area, according to the latest report from the Bureau of Crime Statistics and Research. In a two-year period from October 2012, North Sydney experienced a 66 per cent increase in the incidence of steal from dwelling. 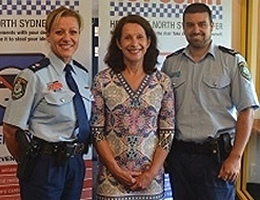 Police from the Harbourside Local Area Command are offering a free residential security audit of homes to improve home security and North Sydney Council will offer up to a $200 subsidy if you carry out recommended work to deter theft.